Since MustangForums is getting more and more new members (particularly in the S197 section), we wanted to identify the S197 Section Moderators and other MF Staff members (listed somewhat alphabetically) in case there is a problem. Please remember that we are volunteers here (and car enthusiasts! ), but we cannot oversee every thread 365/24/7. If you see a problem developing, please shoot a PM to one of the Mods so we can take the proper action. That will help us keep this place running smoothly, which benefits all members. Last edited by howarmat; 05-17-2009 at 07:32 PM. AllS197 sections are for technical threads that are relevant to S197 Mustangs. If you want to write about off-topic stuff, it should be posted in Off-Topic. If you want to plan a regional meet, it should be posted in one of the Regional Sections. If you want to sell a S197 part, then it should be posted in one of the Classifieds Sections. You get the idea. We have received complaints about threads being made in the 4.0L and 4.6L sections that should have been placed in their appropriate sub-forum (drivetrain, handling, appearance). That is why the staff is moving threads and leaving "MOVED" tracer threads. If you are making a new thread, please take to time to consider if it is being posted in the proper section. If we move one of your threads, please do not be offended - we want all members to find relevant threads in the appropriate section. Bashing of different engine/platform/era Mustangs will not be tolerated - especially in the S197 Tech sections. If you want to spout off, then you should do that in Off-Topic. Signature sizes have gotten out of hand. The maximum photo size is 500 x 250. You can right-click your mouse on your picture to see what size it is. If yours is too large, then please resize it. Thank you for contributing to Mustang Forums!!! Our members are what makes this place a great resource for the Mustang enthusiast. S197 FAQ PLEASE READ FIRST!!! The following contains a great wealth of knowledge from many members on this forum. While this is not an end all too all questions, it's a great starting place for a lot of the new guys on the forum. Q: When I try to fill my gas tank it shuts off! A:Yes, there is a Ford TSB (Technical Service Bulletin) out on this. Q: There is a popping noise when I make turns. Q: My Emergency/Parking brake is stuck/frozen! Q: Does the airbag recall affect my tune? A: No, the airbag recall does nothing to the PCM where you tune is. Q:How can I improve the throttle lag? See more below for tuning. This will reset the throttle body settings and give the car a crisper feel. This is not a permanent fix but does help out every so often. Also unplugging you negative battery cable for 15 minutes will reset some settings but is not recommend unless you know what you are doing. Q: How much for a gear install? A: This varies from shop to shop, but 300-500 is typical. Anymore and you need to find a different shop. With that said the rear ends for the S197 are quite picky when it comes to gears. Many people complain about gear whine after install. Make sure your shop is good and has done a few 8.8 or 7.5 Ford rear ends. You might pay a little more that the guy across the street but if it's done correctly the first time you will thank yourself. There is a huge debate on Motive vs FRPP gear sets. The FRPP are generally said to be better gears since the tolerances for the install are more lenient that those of the motives. Motives are a good gear and can be installed with no whine, but it depends on how good the install is generally, as FRPP if not installed correctly will whine also. Q: How much for long tube headers to be installed? A: This also varies from shop to shop. Quotes range from $300-900 for this. Again the best advice is to find a good shop and ask if they have done it before. You should be able to find a place that can do it in less than 6 hrs and less than $500. Some members have been able to do the install themselves in fewer than 6 on their backs, so a shop with a lift should be able to beat that pretty easily. Q: I'm looking for a new exhaust, any sound clips? Q: Will my performance mods void my warranty? A: No, they will not void your entire warranty. Ford will just no longer cover the part that you replace. They canâ€™t say if your axle breaks that it was because of your exhaust upgrade. If you do a mod and they can prove that the mod caused the failure then they wonâ€™t cover it. If you are having trouble at one dealer, try another! Q: What is the difference between an axle back and a cat back exhaust? A: A catback replaces everything from the stock h-pipe back and normally includes an axleback as part of the system. An axle back is basically just swapping out the muffler. Q: My car drones. What is a resonator and where can I get them? A: Drone occurs when you are cruising at a constant rpm and have the exact same muffler setup on both sides of the car. The reason why this produces drone is because the sound waves occur at the exact same time, and sound exactly the same, creating a "drone". Q: What Does the Traction Control System Do? A: Your vehicle may be equipped with a Traction Control system. This system helps you maintain the stability and steerability of your vehicle, especially on slippery road surfaces such as snow- or ice-covered roads and gravel roads. The system operates by detecting and controlling wheel spin. The system borrows many of the electronic and mechanical elements already present in the Anti-lock Braking System (ABS). Wheel-speed sensors allow excess rear wheel spin to be detected by the Traction Control portion of the ABS computer. Any excessive wheel spin is controlled by automatically applying and releasing the rear brakes in conjunction with engine torque reductions. The Traction Control system will allow your vehicle to make better use of available traction on slippery surfaces while you are trying to accelerate or while your foot is on the accelerator pedal. The system is a driver aid which makes your vehicle easier to handle primarily on snow and ice covered roads. During Traction Control operation, the traction control active light will illuminate. If your vehicle is equipped with a message center, a message will display during Traction Control operation. You may hear an electric motor type of sound coming from the engine compartment and the engine will not â€œrev-upâ€� when you push further on the accelerator. This is normal system behavior and should be no reason for concern. Q: How can I make my car MUCH FASTER with MORE POWER? A: The best way for big amounts of power (400+) is a supercharger or turbo charger. Very few people have gotten 400 HP to the wheels with bolts ons. This included head and cam work and is not cheap by any means, probably as much as an s/c or turbo. Nitrous is another alternative for 400+ HP and if this is a route you would like to go then check out this thread. The Shaker has a an RDS option, hold down the menu button for 3 seconds to access the function. It will then display the radio stations or the type of music the station is. Scan through the link below to find many usual threads that our members have discussed through the last couple years. These are very common topics and are helpful to read through before you go posting. Consists of the 6 disc CD changer head unit. It has 2 door subs that are 8â€� and 2 5x7/6x8 speakers in the door and the same on the rear deck. The 4 main speakers are driven by the head unit and not their own amps. There is another set of subs in the rear trunk area power by another set of amps. To upgrade your 500 to a 1000 you will need the shaker 1000 head unit, the amps and subs for the rear and also the complete wiring harness. This upgrade is not recommended at all. Go aftermarket if you want something back there. Also, if you replace the head unit with an after market unit, the subs will still work. Any dealer that says otherwise doesn't know what they are talking about. "If you flash your car can the dealership tell? Yes, they can... No, they cant.... The debate has raged on long enough!!! As it stands TODAY, all the dealership can tell is the last time the computer has been reset. Notice I said reset, not reflashed. Yes, reflashing does set this reset "date". But guess what... so does disconnecting the battery! LOL! So the dealership has no way of known what caused the reset... Simply tell them you left your lights on! LOL! Or in my case the bottle heaters! Ok, so maybe not the bottle heaters! LOL! Now Ford does have a way to download the programming in the computer... if you did not reflash the car to stock then they will obviously see the differences and no you reflashed the car... however if you put the computer back to stock then all they will be able to tell is that the computer was reset... again... oops... i killed my battery... LOL! Hopefully this will put an end to the debate...."
Note: These tunes are not the tunes that SCT or Diablo write. They are specific to your car and are generally better than the factory tunes on the device. Everyone has an opinion and a reason why they chose the tuner and company they did (Price, Performance, Customer Service). You can find many debates and topics about tuning and companies by using the SEARCH function at the top of the page. Here is a post by post Furinox on his opinion of the thought that tuners save you gas mileage. I am not sure why people say the gas mileage is going to increase because it really is not. If anything it is going to stay the same or go down. If you compare your current fuel mileage using 87 octane to your post tune mileage using higher octane of course you will get slightly better mpg because of the higher octane. What I think most of you really want to know when you ask if your mpg is going to go down or up is if it will end up costing you more at the pump after a tune and my answer is maybe. Some of you may disagree but pre-tune lets say you are getting 20mpg using 87octane at $2.50/gal. You have a 16 Gal tank so 16x20=320 miles per tank. The highest octane is usually a minimum of $0.20 more per gallon so considering a slight increase in fuel mileage could be 22mpg? Ok, so 22x16=352 miles per tank. so for a fill up from bone dry 87 octane is $40.00, fill up from bone dry with 93 is $43.20. So...with 87 octane you are paying 40.00 bucks for a tank of gas and getting 320 miles. With 93 octane you are paying 43.50 for 352 miles. with 87 octane $.125 cost per mile. with 93 octane $.113 cost per mile. If your gas station only charges $0.20 more for the highest octane and you actually see at least 2 miles per gallon increase while using it then it is about .01 cents more economical to buy the higher grade fuel. Do not jump for joy yet. Other factors are going to go into account once you tune your car. It is my understanding that a CAI brings more air than fuel into your engine and that is why you require the tune. The tune tells the computer to add more fuel to the motor to account for the extra air thus giving you the extra power. Let me say that one more time, the tune is telling the computer to use MORE fuel. The amount of fuel we are talking about though is very minute. It is my opinion from knowing what I have stated in this post that with a CAI and Tuner your MPG is actually going to go down, but so little that you wont really notice it unless you keep your foot in it. You need to ask yourself these questions and be able to provide the forum with these answers in your post. There are too many choices out there and these questions will help the experienced people answer your questions better. There are tons of threads with the debate/argument on this so please search for some general info first! 2. How much max power do you want to make eventually? 3. How much max power do you want to be able to run on the street? 4. Is torque important to you or just rwhp numbers? 5. Where do you live and what is the climate? 7. Is your car lowered?... How much? 9. Do you plan on rebuilding a forged motor? 10. Is 'whine' important to you? 11. Do you want to be able to have multiple boost levels and tunes? (i.e. race and street) Specific to boost - do you want to run different boost levels on the car? 12. Are you installing yourself? If not... who is? 13. Do you have access to a custom tuner and dyno? Any suggestions? Corrections? I'll add to it. Last edited by howarmat; 01-08-2015 at 09:06 AM. Tired of posting those huge links that stretch the page? Step 1 - Type in what ever text you want in the message box. For this example, I have entered the word 'hi'. Step 2 - Locate the icon that I have circled in the image below. Step 3 - Once you locate it, highlight your text in the message that you wish to hyperlink to, and click on the circled icon. Step 4 - A little box will pop up. This is where you enter the URL/website that you wish to link to. Copy and paste the desired website into this box. You must include the http:// tag, or else it will not work. For this example, I have copied the URL to the google search engine. Step 5 - Select 'OK'. Your selected message should be underlined with blue font, like so. 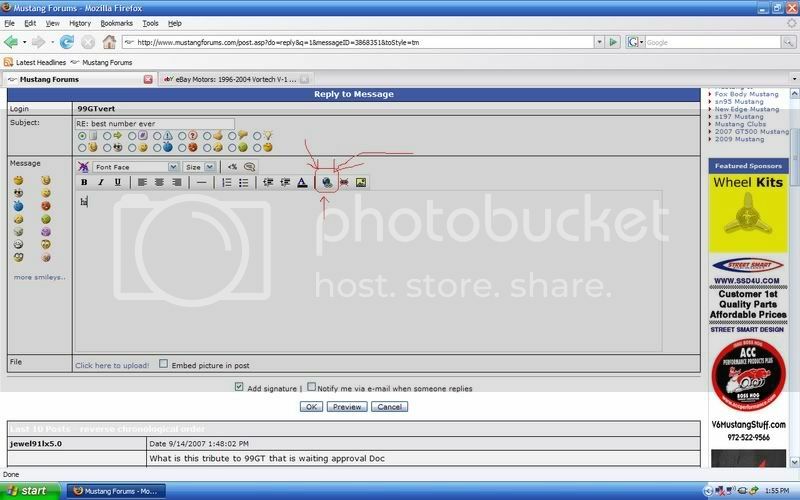 Step 6 - Select 'OK' to post your message. Your post should look like this when fininshed, meaning other users will be able to click on it to go to the desired website. If you wish to see the example provided in action, follow this link and look for post number 40283. If it does not work, repeat the steps again. Moderator: Why hello there, Timmy, and welcome to the 2005-2009 Mustang Tech forum, also known as the s197 Tech forum! Timmy: Well gee-willickers, Mister! Gosh it sure is swell of you to welcome me! I sure can't wait to to post my experiences and thoughts in this forum to share with all the other s197 enthusiasts out there!!! M: Say! that sounds like a great idea, Timmy! Why don't you get started? lol hay guyz, wassup? so i was driving in my s197 and i saw a police car that was a charger and i was wondering what size motors to those have in them? M: [musses Timmy's hair] Haha, no Timmy, this thread is off topic, and should be posted in the Off Topic section. Posting threads in the wrong section makes you a Communist. You don't wanna be a Communist now, do you, Timmy? Timmy: Golly gee no, Mister!! I hate those gosh-darn Commies!! Timmy: Sorry Mister! But how do I remember what posts are considered tech related? M: Why its easy Timmy, all you have to do is remember the word S.H.A.Q.T.A.S.T.I.C. Timmy: Oh boy! Now that I know what to post where, this forum sure will be keen!!! M: That's right, Timmy. [addressing audience] And remember, if your post isn't S.H.A.Q.T.A.S.T.I.C., you're a Communist!! Last edited by Joolander; 08-14-2008 at 05:44 PM. After having to explain this to allot of Mustang owners I figure it would be a good idea to put it here for those who are looking to do this mod. This is factual information gained from talking to a Ford parts dealer, others who have done this mod, looking at a GT500 rear bumper up close and my own real world experience. The myth is that the GT/CS and GT500 bumpers are two different bumpers when the fact is they are the very same bumper. There are only two real differences, 1. How it’s painted. And 2. Cost. For some unknown reason Ford wants you to pay more for what they call their GT500 bumper but the funny part is that it costs more (paint wise) to have it like a GT/CS bumper. The GT500 stile takes less prep and less paint to do so why do they want so much more for it? The only answer I could come of with is that they want you to pay for the Shelby name. "Ok Here is the Lowdown on the Other Parts. Ford Really Has A Mess on there Hands With Service Replacement Parts and Genuine Ford Accessory Parts. Most Dealers are Unaware of the Accessory Parts so you Usually Get Quoted for the Service Replacement parts Vs the Accessory Parts. The Service Parts are More than the Accessory Parts And you get Less! The Service Parts are Just a Bare Cover Where the Accessory Kits Have Extra Goodies. If you Have a GT You Will be Good to Go With the Accessory Kits but if You Have A V6 you Will Need the Additional GT Pieces your V6 will need to get to GT Bumper Specs! I as A Rule do Not Often Post Parts Prices or Part Numbers Because they Change Regularly. In This Case I will Post FORDS Suggested Retail in Order to Give you the Best Deal when Purchasing these Parts Locally! $472.88 7r3z17d957aa GT/CS & SHELBY GT Service Bare FRONT Bumper. $518.27 7r3z17k835aaptm GT/CS & Shelby GT Service Bare Rear Bumper. $ 596.00 7r3z17k835baptm GT-500 Rear Service Bumper. I have the 6R3Z-6320049-BA GT/CS & Shelby GT Accessory Rear Bumper on my car and I ordered it threw a local body shop who got it for a little below the quoted Fords suggested retail price. I can tell you for a fact that the texture on the lower half is the very same as the GT500 which I verified by comparing directly to a GT500 bumper. Now lets talk about that texture for a min because allot of people also asked me, “is there any special prep work that has to be done or, does that texture need to be removed prior to painting?” The answer is no to both. After the normal prep work is done and the paint is applied you can’t even tell it’s textured any more and it blends right in with the rest of your paint. Here are two pictures of mine bumper to show you what it looks like with the textured area on the lower sides painted. I hope this answers your questions and clears up the mystery surrounding this mod. Forum moderators, could you please stickly this in the FAQ section? Last edited by mygt500; 02-05-2009 at 07:15 PM. get all available HP you can. PM me to add anything else to the list. Last edited by howarmat; 01-13-2010 at 06:25 PM. (R+M)/2==Average of Research Octane and Motor Octane and is the AKI of gasoline. AKI==Antiknock Index what the yellow sticker on the gas pump means. ATF==automatic transmission fluid==be sure to use the correct one! GND==ground also denoted as COM for common. H PIPE == A type of exhaust crossover pipe in the shape of an "H"
TEL==tetraethyllead==old time Ethyl fluid used to raise octane of gasoline and also to protect soft exhaust valve seats on older cars. Extremely poisonous!!! Kills O2Ss and CATs on modern cars. For off road use only. WAO==wide *** open (same as WOT in most cases.).. Quick Reply: s197 FAQ and list of bolt ons! PLEASE READ FIRST!! !